Using a pencil, draw an 8×10 rectangle on a sheet of parchment. Flip it over (so the graphite doesn’t get on your bark!) and place on a baking sheet. For the bottom layer of the bark: melt the white chocolate with coconut until smooth, and evenly spread it inside the rectangle you have drawn. Pop it in the fridge until it is firm. For the middle layer: melt the bittersweet chocolate and add the heavy cream. Stir until smooth. Spread this layer on top of the white chocolate/coconut layer and then sprinkle about half of the crushed candy canes on top. Back into the refrigerator to chill. For the top layer: melt the plain white chocolate and spread it on top of the middle layer, top it with the remaining crushed candy canes and put it back in the fridge to chill. When it is totally firm, cut it into squares with a serrated knife. Here it is all packaged up and ready to take to a friend! And now for another bark! Not quite as laborious as the last one, but still festive and delicious. Start off again with a rectangle drawn on a piece of parchment. 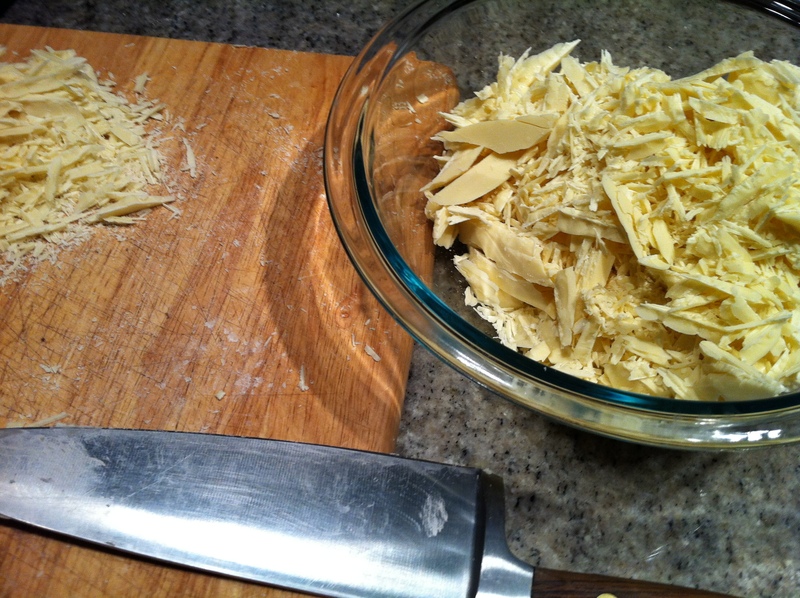 Chop up the white chocolate into thin little slivers. Put 3/4 of it into a microwave-safe glass bowl. Microwave for 30 seconds, stir, microwave for another 30 seconds, stir, and repeat until the chocolate is melted and smooth. 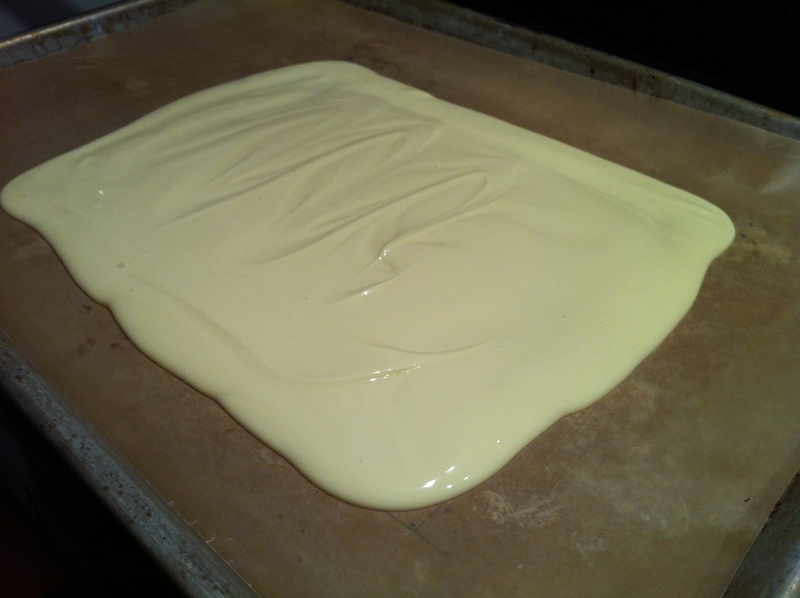 Add in the remaining 1/4 of the white chocolate, and stir until melted. 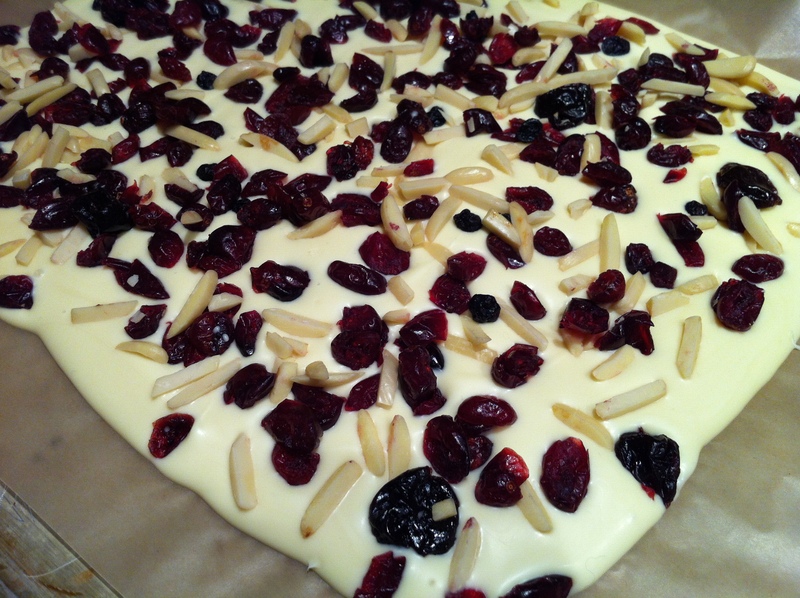 Spread the chocolate out evenly in your rectangle, then toss the cherries, cranberries, and almonds evenly over the top. Let it cool for a bit at room temperature, then put it in the refrigerator to firm it up before chopping. It was heartily enjoyed at a fun and festive holiday party hosted by a fellow foodie friend Dana Casey — check her out on twitter @TriedNTrueBites. This entry was posted in Edible Gifts and tagged almonds, bark, cherries, chocolate bark, coconut, cranberries, gifts, peppermint bark, white chocolate. Bookmark the permalink.